Sometimes, after having a few, we might crave delicious greasy snack food, necessitating a run for the border at Taco Bell or similar. So while we can certainly relate to the desires of Douglas Francisco, who was arrested in Florida this week, we can all agree that he went about this all wrong. 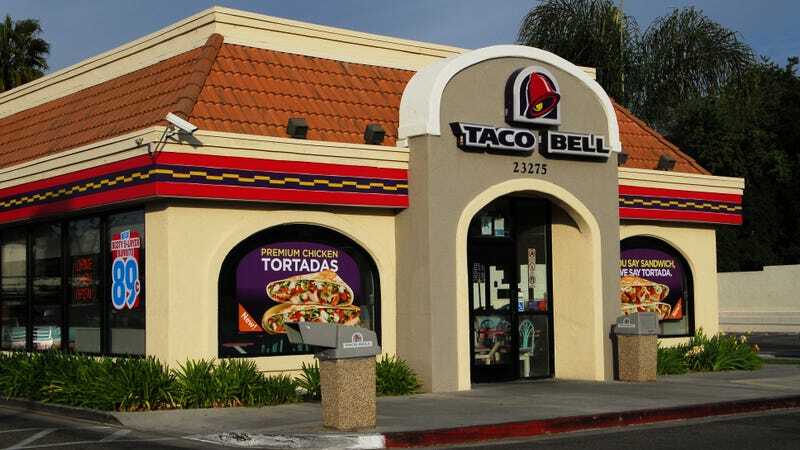 San Diego ABC affiliate 10News reports that on Wednesday afternoon, a presumably drug-impaired Francisco drove into a drive-through and demanded a burrito. Unfortunately, he had driven into a Bank Of America drive-through lane. And subsequently passed out, leading the bank manager to pound on Francisco’s car window. Upon awakening, Francisco asked for the delicious food item, and drove away upon being informed that he was not actually at Taco Bell. Fortunately, Francisco didn’t get very far, subsequently getting arrested by deputies after passing out again in the bank parking lot, where the bank manager identified him as the guy who had clogged up his drive-through. “According to the arrest report, Francisco made several unusual statements,” although 10News doesn’t report whether any of these were chalupa-related. Again, we get the sentiment, but please, people: When you’re fucked-up and craving snacks, you need to try walking. Or Grub Hub.